I have been spending a lot of time of late perusing artworks of the long 18th century, soaking up inspiration for my work in progress and losing myself in the beautiful imagery and skill of the era. 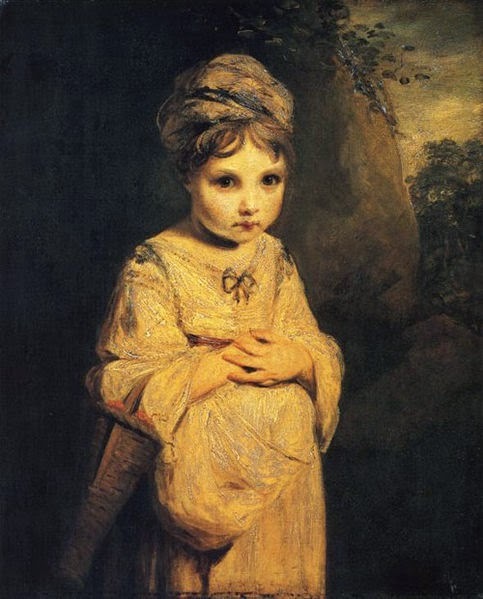 Today I wanted to focus on a fancy picture by my favourite artist, Sir Joshua Reynolds. It is a deceptively simple portrait of an unknown child, and a work that I find most appealing. The painting is known as The Age of Innocence today, though this is not the title Reynolds gave it. Instead, this name was taken from an engraving that was made of the original work in 1794. 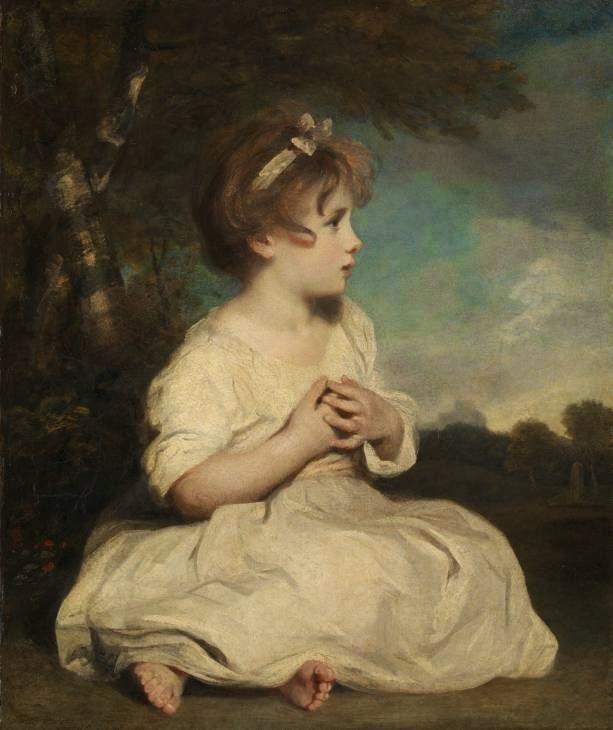 So little is known about the work that it remains a wonderful mystery; it is believed that Reynolds make the study at some time between 1785 and 1788 and in 1785, The Morning Herald made mention of an exhibition at the Royal Academy which would feature a painting of an infant girl by Joshua Reynolds; this work was entitled A Little Girl and it is likely that these two are one and the same. The artwork that we see in the Tate today has been painted over an earlier work entitled A Strawberry Girl and was an instant and much copied, engraved and purchased hit. 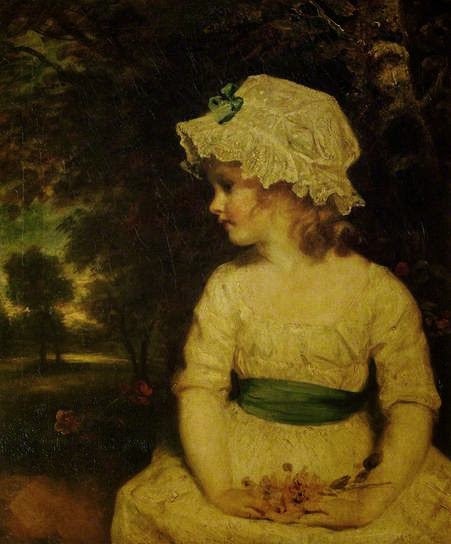 The identity of the little girl in the painting is unknown but it has been suggested that she might be Theophila Gwatkin, the artist's young niece who died in 1844 at the age of 62. Other identities have also been suggested but these require the painting to have been completed significantly earlier than is believed to be the case. There is an appealing simplicity about the image that, contrasted to our study yesterday, shows a female subject at the very start of her life. She has yet to experience the tribulations of like that left Queen Charlotte so rueful in her own portrait. Instead she is settled barefoot in a framing landscape, simply dressed and with no accessories or adornments beyond a simple bow in her hair. For this little girl life has barely begun; we can only share this childhood moment and wonder at what became of her. I couldn't agree more; it's so simple yet so powerful! She gives the impression of watching someone or something off-stage, as it were, to the right. What it is, we can only wonder. Look at "Cupid as Link Boy", read my blog about it, and tell me what you think! Thank you for visiting and for your comment; I am going to read your blog this afternoon, really looking forward to it! She does, very intently too! Any idea of what a signed numbered print might be worth? I don't, I'm afraid but a reputable auction house or expert should hopefully be able to help you out. Do come back and let us know!